Olympic champion Chloe Esposito of Australia secured another career first as she claimed her first Pentathlon World Cup gold medal after a dramatic Laser-Run comeback. The 26-year-old, who fulfilled her potential with a spellbinding performance to win one of the most coveted prizes in Olympic sport in Rio de Janeiro in 2016, showed her class to change the course of the Women’s Individual Final at the third Pentathlon World Cup of the season. Going into the Laser-Run, Kim Sunwoo of Korea held a strong lead thanks largely to her superb Fencing performance. The 21-year-old remained in pole position until the last lap, when Laser-Run specialists Anastasiya Prokopenko of Belarus and Esposito (AUS) realised they had a chance to hunt her down. First Esposito (AUS) moved past Prokopenko (BLR), before the Olympic champion summoned the stamina to reel in the tiring Kim (KOR), who was caught on the finish line by 32-year-old Prokopenko (BLR). Esposito (AUS) had never previously topped a World Cup podium – her best results had been bronze in Rio de Janeiro (BRA) in 2012 and bronze in the 2015 World Cup Final in Minsk (BLR) – and her victory was all the sweeter as it happened in the country she has called her “second home” for the past four years. “I'm so happy just to be back and competing. Last year and early this year wasn't so good and I was feeling down on myself and not sure I was doing the rights,” said the victorious Esposito (AUS). “Today proved to me that I am doing the right things and I am so happy about that. “Before Rio we lived here in Hungary for two years and we moved back to Budapest seven or eight months ago and I call it my second home. I love Hungary and the Hungarians have been so supportive so I'm especially happy to win here. There was such a concentration of high-quality performances that, after struggling in Fencing, world champion Gulnaz Gubyadullina of Russia could only finish 4th while 2012 Olympic champion Laura Asadauskaite of Lithuania trailed in 8th. Home favourites Sarolta Kovacs and Tamara Alekszejev of Hungary finished 5th and 7th respectively, separated by Annika Schleu of Germany. 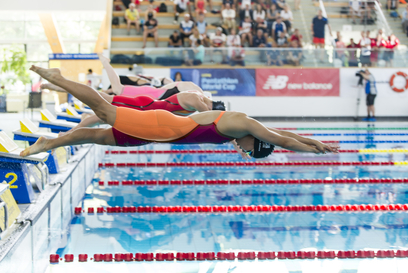 World champion Gubaydullina (RUS) was typically rapid in the pool, with the fastest time of 2:08.97, way ahead of Esposito (AUS) in 2:11.56 and Kovacs (HUN) in 2:11.95. Two names stood out above all other competitors on the piste, as Kim (KOR) and Volha Silkina (BLR) had a day to remember. Each managed a score of 26V/9D in the Round Robin, and Kim (KOR) enjoyed two victories in the Bonus Round to top up her score. Anastasiya Spas of Ukraine and Alekszejev (HUN) were the next-best performers with 22V/13D, while Prokopenko (BLR) and Esposito (AUS) did just enough to stay in contention with 20V/15D and 18V/17D respectively. Eight athletes managed a perfect score of 300 on horseback, including Prokopenko (BLR) and, to the delight of the home crowd, Kovacs (HUN). It was a fine Riding day for Russia as Liudmila Tebekina and Ekaterina Khuraskina top-scored and Gubaydullina managed 293. The main narrative did not change greatly as Kim (KOR) and Silkina (BLR) made sure they would be the first starters in the Laser-Run and Esposito (AUS) kept herself close enough to mount a challenge. Kim (KOR) set off 14sec ahead of Silkina (BLR), with Ieva Serapinaite (LTU), Spas (UKR) and Kovacs (HUN) all within 30sec of the leader. However, it was not a huge surprise to see the more established Laser-Run performers move up through the field during the four laps. Esposito (AUS) started with a 39sec deficit but timed her assault perfectly, and arrived at the final shooting range in 2nd place. The Olympic champion was stunned, however, to find that Prokopenko (BLR) had moved up from 11th place to keep her company, and the latter produced an ice-cool shoot of 7.46sec to leave the range in the silver-medal position. Esposito (AUS) was not in the mood to let anyone ruin her day, and she immediately moved to the shoulder of Prokopenko (BLR) on the last lap. By now Esposito (AUS) could see the leader up ahead and she proved that her competitive fires are burning as brightly as they did in 2016 by accelerating past both her rivals to take the tape by a 4sec margin. Behind her, the veteran Prokopenko (BLR) strained every sinew to deny Kim (KOR) the silver medal in a thrilling sprint finish that left both flat out on the grass. In the final analysis, the times demonstrated the sheer class of the world’s leading Laser-Run specialists as Prokopenko (BLR, 12:24.78), Asadauskaite (LTU, 12:27.77) and Esposito (AUS, 12:31.15) produced a masterclass in the discipline. 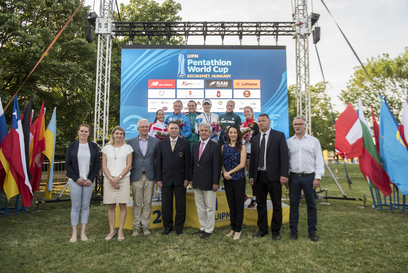 UIPM President Dr Klaus Schormann said: “Here in Kecskemet we have had a strong demonstration of what it means to follow athletes of the highest performance. “Today the Olympic champion from Rio de Janeiro, after she had a rest last year, was running and shooting in such a perfect way to catch up with Kim Sunwoo and win this World Cup, and Anastasiya Prokopenko ran so fast to finish 2nd. 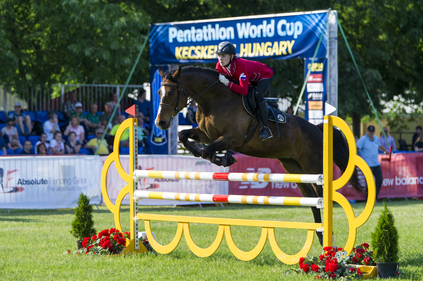 “Again we have seen great organisation from the Hungarian Modern Pentathlon Association, with excellent horses, enabling the athletes to compete in facilities that are exactly what we want in all World Cups and World Championships. 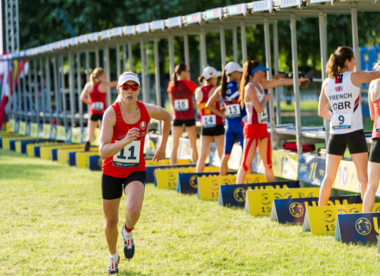 The action at Pentathlon World Cup Kecskemét continues tomorrow (May 6) with the Men’s Individual Final, followed by the Mixed Relay on May 7. Live stream of the finals is available on UIPM TV and up-to-date results of all competitions are available at the UIPM website.